WHO: Gracious Jane Marie aka Jane Marie Malcolm is an author first and artisan second, who was born a century and a half too late, according to her imagination that often visits Victorian America. WHAT? 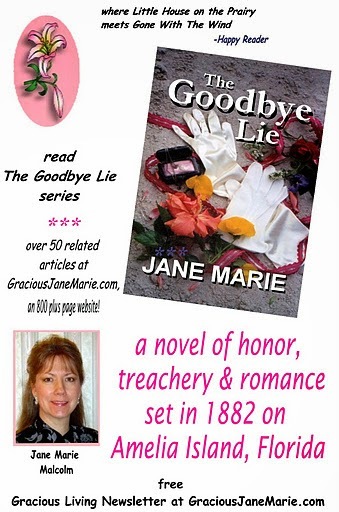 ﻿Jane Marie is the creator of The Goodbye Lie historical romance/mystery/suspense series, where "Little House on the Prairie meets Gone With The Wind..." The deeds and misdeeds of the Dunnigans of Amelia Island, Florida will ensnare you. Strong family bonds and honor do fierce battle with deceit and danger. WHEN: The historical novels take place in 1882, 1889 and 1898. WHY? Jane Marie has created a world of fantasy folks, including the Dunnigan family and their neighboring Duffy kin, as well as the townspeople, all of whom occupy the still standing place of Fernandina Beach, Florida, but in imaginary times gone by. Her world is so rich with emotion, charm and stunning surprises, she wants to share it with all. Jane Marie Malcolm says Welcolm! Why the funny spelling? This spelling is her repeated error because it is similar to her last name. As with most things she does, Jane Marie tries to turn mistakes into mad marvels and is not embarrassed to share her fun, faults and freedoms. A mother, grandmother, and former first lady of Fernandina Beach on Amelia Island, Florida, by virtue of being married to the former mayor, Bruce Malcolm, Jane Marie makes her home there with her charming husband, Bruce, and a dog and kitty. She is an avid Prince of Peace handbell ringer, as well as, a member of the American Legion Auxiliary, the Amelia Island Museum of History, the General Duncan Lamont Clinch Historical Society of Amelia Island and Writers by the Sea. 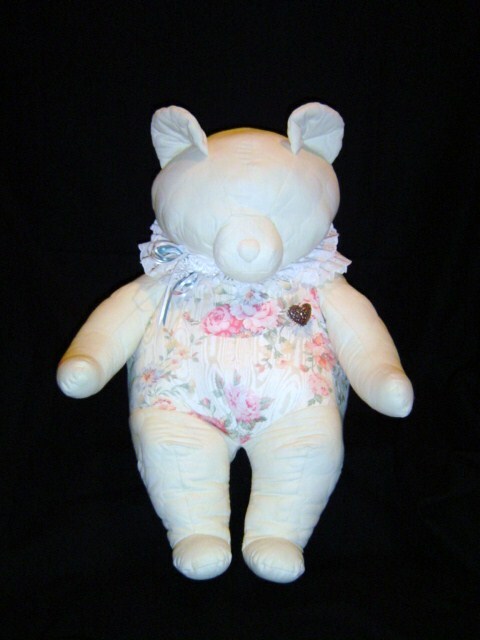 Jane Marie is a practicing rosarian, quilter, and artisan, and has fashioned family christening gowns by way of French heirloom hand sewing techniques. 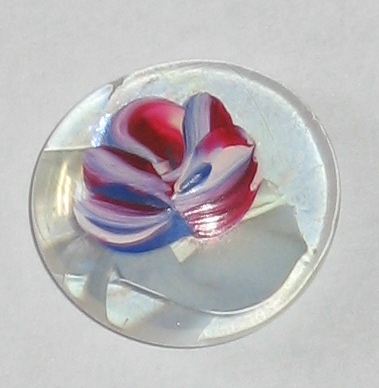 Her cleverly created painted Secret Pebbles and crafts tie into the GOODBYE LIE Series. She dabbles in playing the musical saw and has mastered the harmonica and canjo - to the best of her ability. Share Jane Marie's blog, AMELIA ISLAND BOOKS with your friends. Just tell them to Google the Gracious Jane Marie Blog. Meet or get reacquainted with Waite Taylor. Using descriptions and quotes taken directly from the pages of my historical novel, Amelia Island's THE GOODBYE LIE, here is a profile of Waite, the male lead in the story set in 1882 Fernandina on Amelia Island, Florida. Born: That face had seen many a scrap in its thirty-odd years, she guessed. Parents: ...the sole child of a Venezuelan heiress, Carla Montoya, and an English seaman, Kenneth Waite Taylor. Height: He was easily a head taller than she. Eyes: Breelan looked into his deep black eyes. She had to speak for fear she'd tumble into their depths in the silent moment that followed. Hair: The dark hair was full, damp, and wickedly wild from the weather, yet it suited him. His Physique: The broad shoulders of a man lying on top of her were blocking her line of sight. ...how graceful his movement for a man of his size. A strong arm caught her round her waist. His Scent: He smelled of leather and bay rum cologne. He smelled good. His jaw was so square, ... the line of it broken only by the cleft in his chin. His nose was surprisingly straight, considering the small uneven scars he wore at his hairline, across his right cheek and on his neck, just below his right ear. Occupation: "Waite Taylor, captain of that passenger liner... His father ... was killed when his vessel was rammed broadside by a sinking Federal supply ship. They say that since that time, his son vowed to have a career at sea, no matter what manner of ship he served on, in honor of the man who'd shown him the wonder of the waters." Character: Strange. Miss Ella would even trust this man alone with her daughter. She was certain he would never physically harm her girl. "I would say you were a man who'd experienced much in life and one who is probably capable of handling most any situation." He was certainly old enough to be married. 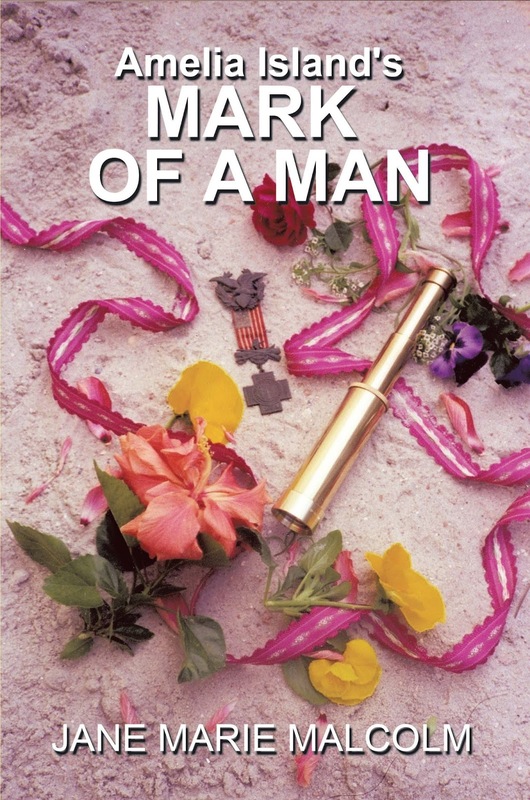 His days of running after different girls should be over unless he was a widower or a philanderer. Yes, she'd known him long enough to classify him as a philanderer, snagging every fast trick his barbaric bulk craved. Military Service: "He joined the Confederate Army at sixteen. I understand his father wanted him by his side to fight the Yankees at sea, but Taylor chose to stand with the lads from his class on land. He served with the Third Florida in the Battle of Olustee. ... he received a battlefield commission raising his rank to lieutenant." Checking a nearby line, a young crewman interjected innocently, "Ah, go on, Cap'n. Tell the good folks how they give ya a medal for valor on the battlefield so's they can rest easy." History: "He was raised in the Florida Keys and sailed the Caribbean with his father until his mother's passing when he was fourteen. After the war, he earned his shipmaster's license and eventually became the youngest captain in the history of the transatlantic shipping company, Atlantic Eagle Cargo Lines. For a dozen years, he commanded a regular run between Baltimore and South Hampton, England, delivering lumber, turpentine, cotton and phosphate. I understand he wanted a change, so built his passenger ship, Gentle Comfort, named in memory of his beloved mother, and he's been running the Comfort along the eastern shore of the United States ever since." His Quote: "Just to be in her town was an ordeal, but I had to take control. I had to face things. When we arrived yesterday in Fernandina, all my resolve left me. That's why I stayed aboard. I wasn't just reading. The truth is I was studying, investigating where she comes from, trying to get closer to her somehow. The more knowledge I acquired about her background, the worse I wanted her. So I purposely started drinking last night until I passed out. With enough liquor in me, I knew she'd be safe from the wild man who wanted to pound on her door in the middle of the night and take her away for himself. "This morning, with damn near the worst hangover I've ever had as a reminder of my determination [to stay away], I was prepared to be strong and leave town without ever attempting to see her. I was counting the minutes until we pulled out, until I escaped Amelia Island. You can't know how shocked I was when she arrived at the foot of the dock, her father handing her over to me! It was her uncle, Clabe Duffy, who corresponded with me. I didn't know the name. I swear to God, I had no earthly idea she was one of the girls I was to watch over. Now she's here, aboard my ship, and so is temptation." Ask Jane Marie- What's Up with the Name? How observant are readers of my Goodbye Lie series set on Amelia Island? 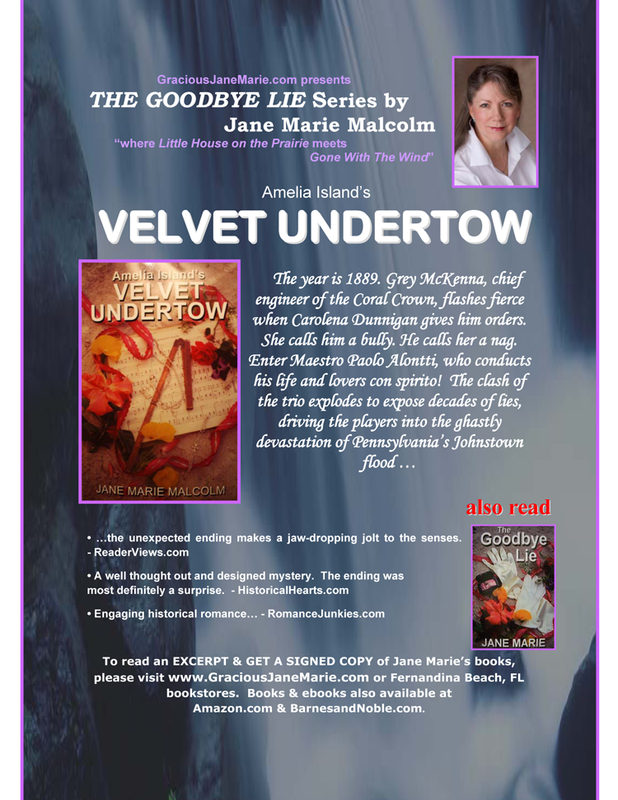 Very, because I am often asked why my name on the cover of The Goodbye Lie is Jane Marie and on the cover of Amelia Island's Velvet Undertow, it is Jane Marie Malcolm. (I get lots of: Did you get married?") 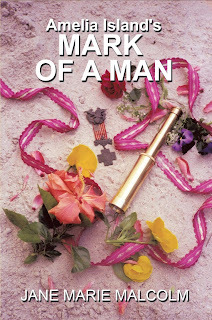 Originally, my pen name was to be Jane Marie, which is my real name. My daughter, Barbra, thought it sounded more romantic for a writer. All was well until Amazon.com added my last name. I thought it best to avoid confusion so I now use my full handle going forward. witty, wise and weird entries!